Mandala – Close up on me ! Head Skin Applier : COLIVATI BEAUTY – Meghan – Tone 5 (Lelutka) ♥. By Colivati NEW!!! Pants : BLUEBERRY – Sammy Jeans – Fatpack . By Blueberryx NEW!!! Boots : BLUEBERRY – Sammy Boots – Fatpack . By Blueberryx NEW!!! Skirt : IAF – Havannah Zip Skirt (white) with appliers at The Designers Market!! 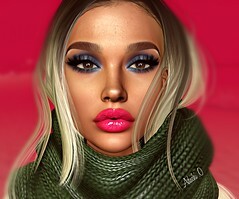 Hair : Argrace – Akane Dark Blondes , comes with pose hud! !